Dublin has now joined the growing league of cities that can boast a bike share system. Let's hope that it brings out the style. These photos from The Irish Times show that Dubliners are off to a good start. Read more in this Irish Times article. Thanks to Doireann for the link! I saw this over the weekend. My initial delight was undermined somewhat by the choice of punters represented, or more specifically, by the narrow range of occupations- seven of the nine interviewees are young creatives of one sort or another. I mean, if the point of the article was selling cycling to the masses, then a wider range of professions would have been far better. It's hardly headline news that hip young things cycle around the city. They've - we've ;) - been at it for years. Where were the 40+ age bracket? Where were the parents going to school? Where were the construction workers, the lawyers, the engineers, the town planners? Lovely photos and plenty of sensible advice (except for the helmet talk! 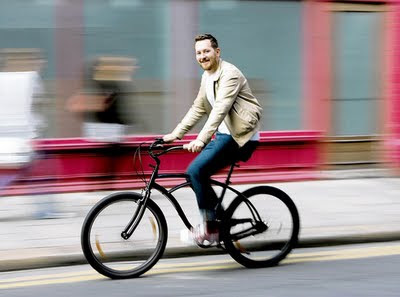 ), but a golden opportunity missed (and, possibly, the case for the 'mainstreaming' of cycling undermined, if the masses see it and think 'Well that's all well and good, but I'm not young/trendy/pioneering/etc.'? ).